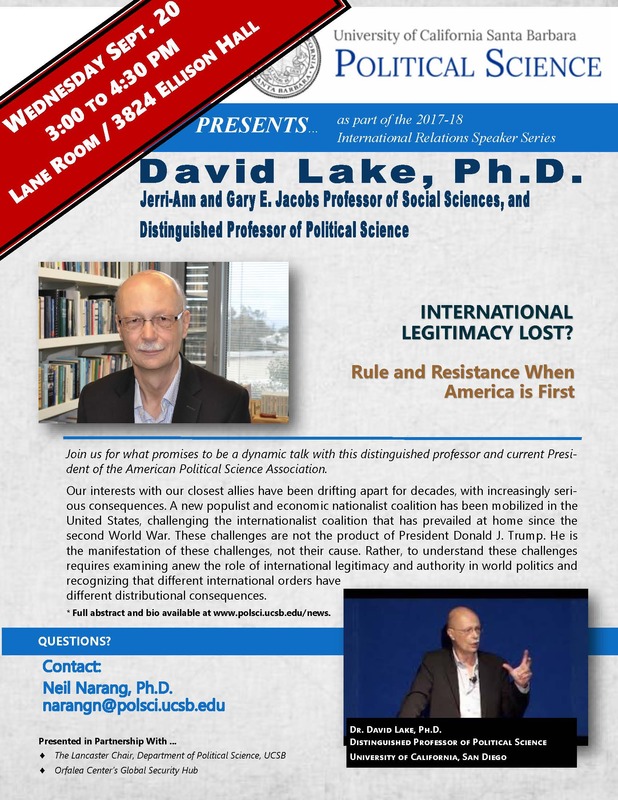 International Relations Speaker Series: David Lake, Ph.D.
Join us for what promises to be a dynamic talk with this distinguished professor and current President of the American Political Science Association. Our interests with our closest allies have been drifting apart for decades, with increasingly serious consequences. A new populist and economic nationalist coalition has been mobilized in the United States, challenging the internationalist coalition that has prevailed at home since the second World War. These challenges are not the product of President Donald J. Trump. He is the manifestation of these challenges, not their cause. Rather, to understand these challenges requires examining anew the role of international legitimacy and authority in world politics and recognizing that different international orders have different distributional consequences. * Full bio and abstract available here. Presented in partnership with UCSB's Lancaster Chair, Department of Political Science, and the Orfalea Center's Golbal Sercurity Hub.